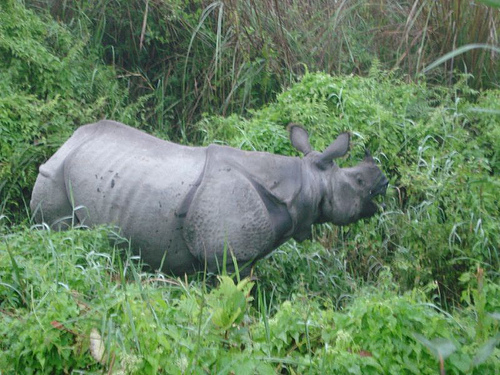 Nepal tour 6 night 7 days highlights of this trip is the Chitwan Jungle safari. The 500 Asian one-horned rhinoceros and some hundred nocturnal Royal Bengal tigers that live in the dense forests of the park. You will discover a lost world of towering trees and twisting vines, of pre-historic rhino and lumbering elephants, crocodile, python and deer; brilliantly colored birds and if you are fortunate - the superb Royal Bengal Tiger. Sharing home with these are other animals like rhesus monkey, grey langur, deer, leopards and wild cats etc. 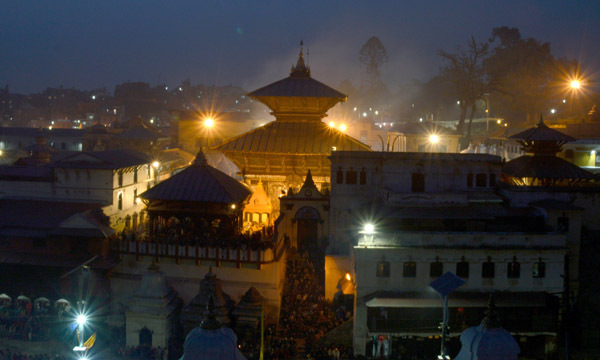 Nepal tour 6 night 7 days tour is enough to taste the real flavor of whole Nepal. Kathmandu valley offers you an opportunity to experience majestic art and architecture of medieaval era. 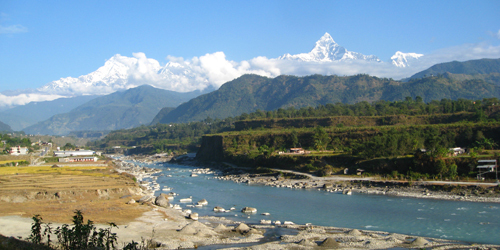 Chitwan and Pokhara are the paradise for nature lovers. Day 01: Arrival in Kathmandu international airport. Orientation program. After tea coffee in Hotel . Your journey will begins from sightseeing of Swoyambhunath Stupa. The Swayambhunath Stupa is also known as monkey temple which is a 2500 years old stupa situated on a hillock about 500 feet above level of the valley and over looking Katmandu valley. Overnight at Kathmandu in Hotel.Overnight at Kathmandu in Hotel. Day 02: Morning Everest Mountain flight. Afternoon Kathmandu valley sightseeing ( Bhaktapur Durbar Square, Baudhanatha Stupa and Pashupatinath Temple) Overnight at Kathmandu in Hotel. Day 03: Drive to Chitwan National Park (5 hrs). On the way to Chitwan three hour rafting. Briefing of jungle activities by Nature guide. Evening local tribe cultural show. Overnight at hotel in Chitwan. Day 04: Full day Jungle Activities (Elephant Riding, Bird Watching, Canoe Ride on the Rapti river, Elephant bathing etc.). Overnight at hotel in Chitwan. Day 05: Morning drive Chitwan to Pokhara. Evening excursion to the Phewa Lake. Overnight at Pokhara in Hotel. Day 06: Early in the morning drive to Sarankot to view sunrise in Annapurna Mountain range. The Sarangkot is a famous Hill station nearby Pokhara city at an altitude of 1600 meter from sea level. From Sarangkot you can observe beautiful sunrise over Annapruna mountains. This is also one of the best view points of Mt. Annapurna Range, Mt. Dhaulagiri, Mt. Lamjung to the north. On the southern direction of this hill overlooks the Pokhara city and Phewa lake on the north western outskirts. After having breakfast drive to Pargliding spot then half an hour Paragliding from Sarankot. These days Sarangkot is very famous as the take off point of paragliding. At the ridge of this hill Enjoy the specticular view of Annapurna mountain and beautiful village of Sarankot and Hengja. Afternoon Pokhara valley sightseeing (Davis fall, Gupteshwor Mahadev cave, Bindhyabasini temple). Overnight at Pokhara in Hotel. Day 07: Morning one hour boating in Fewa lake.After breakfast visit to the World Peace Stupa (at 1,113 m). The World Peace Stupa is is Buddhist temple was built in 1996 with a view of the lake, across the city and of the snow peak mountain ranges of Manaslu, Annapurna, Machhapuchare (Fishtail, which is named from its shape) and Dhaulagiri Himal. Around 11:10 morning fly Pokhara to Kathmandu. Afternoon Kathmandu valley sightseeing (Patan Durbar Square and Kathmandu Durbar Square). Shopping. Evening fare well dinner with Nepali culture show. After dinner transfer to Kathmandu International airport for final departure.